As I approach my third year as editor-in-chief of World Neurology, I wish to thank the many individuals who have helped to achieve our successful conversion from print to online format. The support and contributions of the officers and trustees of the World Federation of Neurology, the editorial advisory board, and Keith Newton’s assistance as assistant editor have been critical. Additionally, I wish to acknowledge the expert help by Rhonda Wickham and her associates at Ascend Integrated Media who have helped to unravel the process of online publishing and compose attractive pages. Their role is no less critical. Perhaps most importantly, the quality of original articles, book reviews, reports, and photographs has been superb, and I thank all authors and photographers. 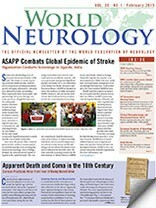 World Neurology’s future success will depend directly on your continuing contributions. If you are hesitant about the appropriateness of a submission, please contact me to discuss how to proceed. In his President’s Report in this issue, Raad Shakir outlined the many important organizational advances that took place in 2014, including the development and strengthening of many regional neurological associations in conjunction with the WFN. This strengthening will be an important element in addressing one of the biggest problems that neurology must deal with — the resources that are available to provide clinical care and conduct needed research are wholly inadequate in many countries and regions. Recognition that neurological disorders account for a very high proportion of all illness has been slow in coming. Even though the data that quantifies the global burden of nervous system disorders is still quite incomplete, it is clear that the disorders that are in the domain of neurology constitute a very large proportion of all illness globally. We must use the available epidemiology as we continue to advocate for the allocation of sufficient resources for the prevention, clinical care, and research that are clearly warranted by the data. Fortunately, we are witnessing remarkable progress in research on almost every front. In addition to neuroscience itself, advances in genetics, immunology, microbiology, robotics, stem cell research, and many other fields will yield new therapies at an accelerating pace in 2015 and beyond. The initiation of national programs such as The Brain Initiative (U.S.), the Human Brain Project (European Union), and Japan’s Brain/MINDS project reflect national commitments to bring research, primarily brain mapping at this point, to levels that will lead to understanding the biological basis of nervous system disorders. Many organizations are looking for ways to improve implementation, to bring clinical and laboratory research to all populations, whether in wealthy or low and middle-income countries. The phrase of the moment is “translational research,” originally used to describe bringing the fruits of laboratory research to the bedside. Neurologists must be active participants in the translation into practice by designing safe and credible clinical trials and working to make new therapies available to all who need them. In my editorial in December, I introduced the use of “translational research” to also describe instances in which the results of epidemiologic research lead to the development of new public policy. Again, some neurologists will be in a position to help make this happen. Another relatively recently coined term is “implementation science” — dealing with questions such as why do established programs lose effectiveness over time, and how can multiple interventions be effectively packaged to increase cost effectiveness? Again, we as neurologists can both contribute to the science with our own research, and do more with the resources that are available. You will think of many other examples of unmet challenges and opportunities, and I invite your comments, articles, and/or letters to the editor.